Induction power sources will be 95% efficient. Input current will not exceed 3 Ampere. Digital timer for heating cycle adjustment. Foot switch operation is also possible. 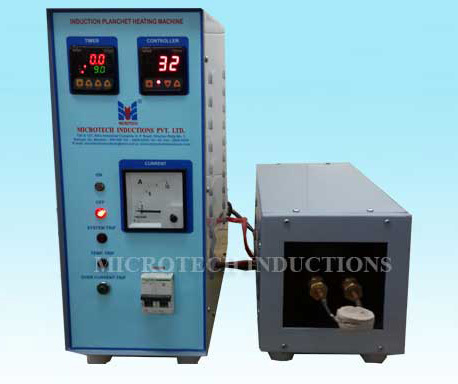 Induction generator & Inductor is separated with 2 meter extension cable. Dimensions: induction generator H: 14", W:6.75", D:19.5"
Dimensions: Transformer Box H: 8.25", W:7.5", D:8.25"
Operating cycle Repeated operation of instant planchet heating up to 900°C within 15 sec.